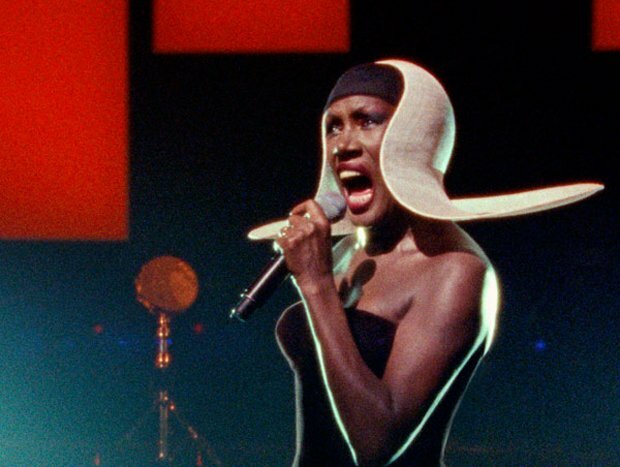 In one of the many memorable moments in this cinéma-vérité style documentary from Sophie Fiennes, Grace Jones makes an appearance on French television to sing her disco version of 'La Vie en Rose'. Unimpressed by the dancers' tacky attire – in her opinion they are being paraded as if in a brothel – she requests they be removed. Seconds later she feels a pang of guilt for the women, but sticks to her guns. Fiennes spent five years filming Jones, capturing her fiery public persona but also unmasking many more facets of the pop icon. The film switches between a dazzling live performance shot at the Olympia Theatre Dublin – with a backdrop of exquisitely lit panels taken from an original concept by Eiko Ishioka that had never been realised – and Jones's personal life, revealing the significance of her songs. Fiennes takes an operatic approach to her documentary, building narrative through music and it's mesmerising to watch the singer in action. A disco ball bowler hat with lasers projected onto it is almost hypnotic, as the film recalls Frederick Wiseman's Crazy Horse in its captivating theatricality, with each sequence impeccably edited. The quieter scenes reveal Jones's vulnerability, humour, passion and anger. An emotional family reunion in Jamaica sees Jones confronting demons, but also exposing a softer side, as she wells up with pride at her mother singing in church. She chats openly about her infamous TV show run-in with Russell Harty to her companions in a dressing room after a gig, and the unobtrusive fly-on-the-wall approach adds a relaxed intimacy to these behind-the-scenes moments. Despite Jones having some control over the project, this is more than a hagiography; tantrums at fee discrepancies and a fierce phone call while in the middle of recording her 2008 album Hurricane are genuinely tense, with Fiennes letting these furious displays play out. Limited release from Fri 27 Oct.